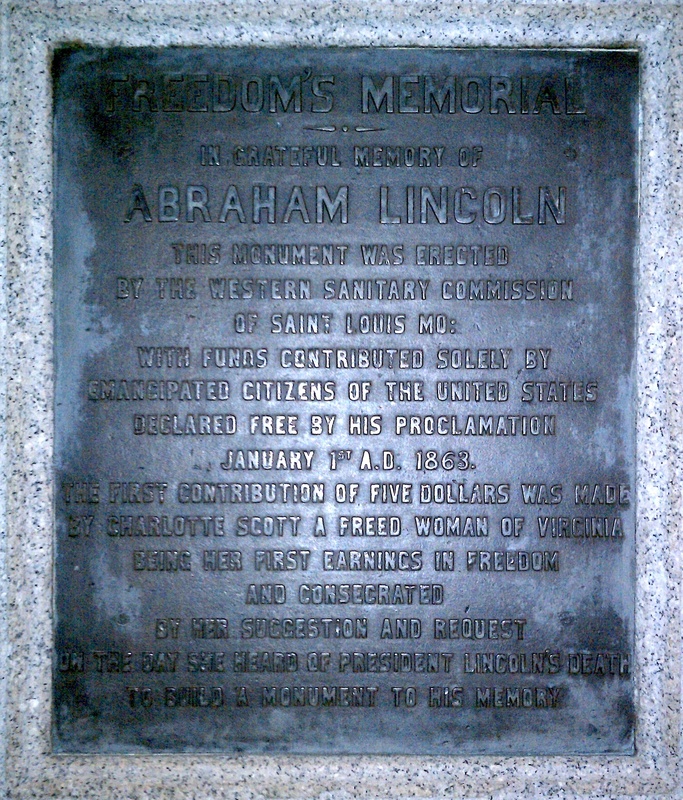 Text of the dedicatory plaque, Freedom's Memorial, Washington, D.C., dedicated 1876, crediting William Greenleaf Eliot's Western Sanitary Commission and ex-slave Charlotte Scott's "foundation $5"
NOTE: This is a highly selective chronology of events that piqued my interest while researching and writing The Great Heart of the Republic. Hence, it is a “work product” more than a footnoted, annotated, triple-checked publication. Corrections and additions welcomed. For an extensive timeline focused on the national story of the Civil War, see the New York Times‘ Disunion feature. 1836 May 24 New St. Louis Theater, 3rd and Olive, designed by Meriwether Lewis Clark, opens. 1857 August 24 Panic of 1857 precipitated by failure of a New York financial institutions. 1858 May 18 Leavenworth Constitution ratified by Kansas voters; rejected by U.S. Congress. 1860 April 3 Pony Express begins operation out of St. Joseph. 1861 January 29 President James Buchanan signed Kansas admission bill. 1868 January 14 St. Louis newspaper claim to have the only functioning typewriter in the U.S.
1870 November Benjamin Gratz Brown wins as Liberal Republican governor, with support of Democrat Frank Blair Jr.
1876 August 22 Election on the scheme of separation; seems to fail.